Earlier this year, Health Education England published the Topol Review. The report proposed how to best prepare the NHS workforce for a digital future. It offered concrete recommendations on how best to utilise digital technologies in health care. It is aligned with the Five Year Forward View, the NHS Long Term Plan and many of the regional integrated care programs already underway recommending that providers across healthcare work together to educate and engage the public on the benefits of digital health. Patients must be regularly updated about new digital health technologies that affect them, with a focus on vulnerable communities to improve health equity. The healthcare workforce should be kept informed of any developments in digital health and given enough guidance in order to effectively evaluate new health technologies and train staff. New technologies should be adopted to improve the overall patient experience and to give healthcare staff more time to care for their patients. The review notes that for these healthcare innovations to be fully realised, the NHS must first create and develop a sustainable, digitally robust healthcare workforce. 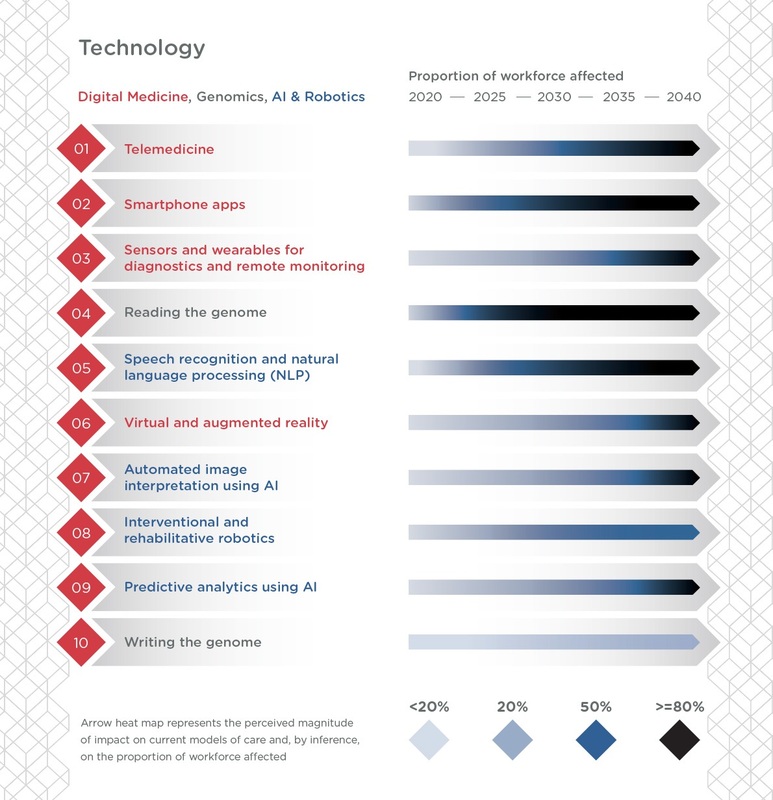 The Topol Review also includes a list of the top 10 digital healthcare technologies and their estimated impact on the health workforce in the next 20 years (see image below). With many NHS Trusts working hard to improve their digital maturity and the associated training to support those activities, some could baulk at the additional training that would be required for many of these new technologies. As an organisation heavily involved in both training and communications in the NHS, we see that there will have to be significant investment in training both in terms of radically improving digital health in clinical qualification syllabuses and for the workforce that already exists across the different care settings in the NHS. Right now, the impact on an NHS Trust to train its workforce in a single new system such as a new EPR or PAS is significant both in terms of cost and disruption to their operations. Many have already looked to mitigate the impact of these training requirements by adopting the use of blended training (mix of classroom-based, online, drop ins, at elbow, etc.) and using an LMS (learning management solutions) to support ongoing training of staff. We are engaged with numerous NHS organisations supporting training and nearly always the requirements are different in terms of the mix of blending teaching and learning required between different organisations. Initiatives such as the NHS Digital Academy are also helping, but the size of the task required for the NHS workforce, as a whole, is something that requires an approach which can be delivered locally and at scale across technical, operational and clinical staff. Considering many NHS Trusts have training teams consisting of less than 20 staff (and often less than 10 staff) to train the 5th largest employer on the planet, there have to be some radical changes to how training is delivered and invested in to stand any chance of upskilling on this scale. We just hope that is represented in how priorities and budgets are assigned moving forward. If this doesn’t happen then many of the initiatives around digital health will fail to realise their full potential or even stall in their entirety. Topol highlights this and our own experience shows that when training is left as an afterthought or given a lower priority the resulting issues negatively impact the successful roll out or adoption of a system. Perhaps this is something that NHSX can have high on its priorities list within its mandate and provide funding that could be ringfenced to support it?